Low position (150 kg max). To release the floor, push slightly forwards then raise. 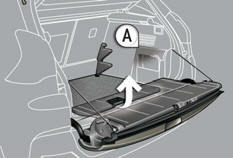 Use the stops A , placed on each side of the boot to change the height of the floor more easily. Intermediate position (100 kg max). 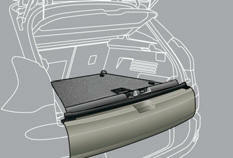 High position (50 kg max) with the lower tailgate closed to isolate the lower part of the boot. 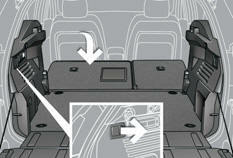 From the high position, place the floor in this position (at an angle), two stops support it to allow access underneath it or to the spare wheel. 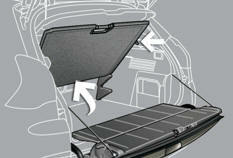 Place the adjustable floor in the intermediate position . Check that nothing is preventing the seat backs from folding (front seats sufficiently advanced, head restraints, seat belts, ...). 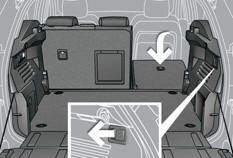 Check also that no object on or under the seat could hinder its movement. 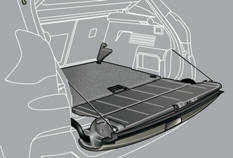 Pull the control of the 1/3 section, from the boot. Pull the control of the 2/3 section, from the boot. 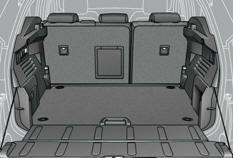 The seats are aligned with the adjustable floor and the lower tailgate.